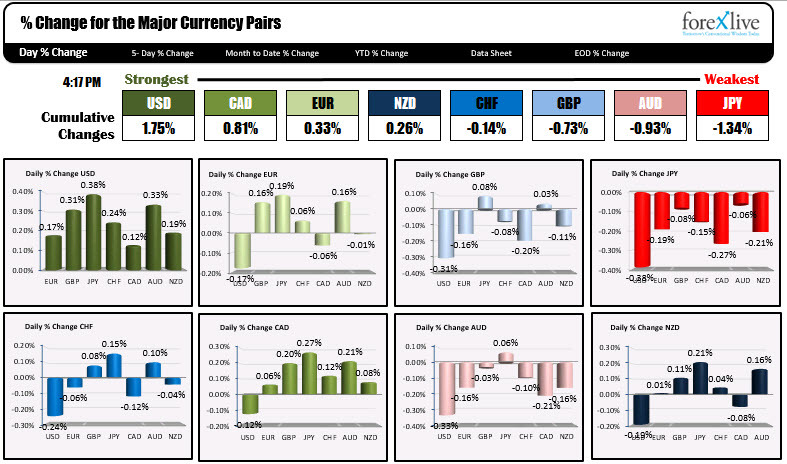 Forexlive Americas FX news wrap: USD continues to move higher on back of stocks, yields. WTI crude oil is trading at $54.75 in after hour trading after settling at $54.56. The contract tested its 200 hour MA near the lows for the day and bounced. CLICK HERE for a technical view from the price action. In the US and European stocks today, US major stock indices closed higher ahead of earnings from Alphabet after the close (they beat but the stock moved lower at least initially). The Nasdaq led the charge with gains of 75 points or 1.15%. The Dow and S&P has more modest gains of around 0.70%. European shares were mixed. Below are the ranges and changes for the major US/European indices. The US yields continued their run higher with rates along the curve rising from 3 to 4 basis points. On Friday, yields pushed higher after the better than expected employment gains. Today the momentum from those moves continued. The benchmark 10 year yields in Europe end the day up 1 to 3 basis points (with the exception of the Italian yields which fell -1.3 bps). The higher stocks and yields were joiined by a higher dollar as well. The USD was the strongest currency of the day. The JPY was the weakest. Each, however, are trading off their extremes (near the close). The USDJPY rose by 0.38% and is trading at 109.91 near the close. The high price did reach 110.15 before coming off in the US afternoon trading. The high extended to a new 2019 high - surpassing the Jan 23 high of 109.993, but is closing back below that level. The USDJPY came off in the NY afternoon despite moves higher in stocks and yields, which is against normal flows. The EURUSD was mired in a very narrow range coming into the NY session (about 23 pips) and ended up extending the range to 36 on a break to new session lows. The move was helped by a break below its 100 day MA at 1.14406. The low for the day reached 1.1423, before rebounding modestly (trading at 1.1432 near the close). Staying below the 100 day MA in the new day would keep the sellers in firm control. A move above that level and then the 100 hour MA at 1.14527 would hurt the bearish picture. On the downside, the rising 200 hour MA comes in at 1.1419. A move below it should solicit more selling pressure. The GBPUSD is trying to close below its 200 day MA at 1.30427 (trading at 1.1337). Regardless, if it does or not, in the new day traders looking for more downside, need to see the price move away from that MA level. The sellers have a chance to take more control. Failure to do so, will have shorts giviing up. I would expect a run higher with the 100 hour MA at 1.30898 and the 200 hour MA at 1.3105 as levels to get to and through. Those MAs stalled rallies in trading today. The USDCAD closed below its 200 day MA for the first time since October on Friday (comes in at 1.31179). Today, the price moved back above that MA line, souring the bearish break. However, the pair did peak at 1.3147 and some afternoon USD selling is taking the price back toward that key 200 day MA. We enter the day with the price near the 200 day MA at 1.31179. The market will take its bias clues from the tilt above or below the level. The AUDUSD continued the corrective move lower but stalled at the 38.2% of the move up from the Jan 25 low at 0.72108. ON the topside, the 100 hour MA comes in at 0.7233. The RBA is expected to keep rates unchanged when they announce the results from their meeting in the new day (see post here). Traders will use the 0.7233 above and the 0.72108 below as levels to get above (for more bullish) or below (for more bearish on the details from the statement.